GBC OptioBraid Lanyards with Combo Loops make your life easier by giving you quick access to keys, keycards, ID cards, and more for any sized business. Designed with a combo loop for easy and convenient holding, these GBC OptioBraid lanyards are stylish, functional, and affordable. These OptioBraid lanyards from GBC are 35-1/2" in length and made for durability and flexibility, making them perfect for busy, active persons. Check them out today and save with MyBinding.com. This works wonders! I love the Lanyard Combo Loop and my customers love them also. Wonderful company with beyond awesome items. 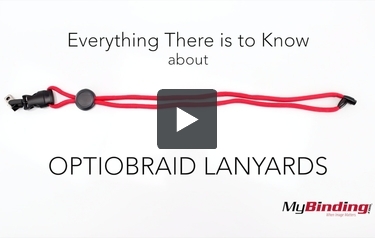 This is Everything There is To Know About Optiobraid Lanyards! Lastly, there are several colors to choose from. I need to attach a badge 3.5" X 5.5". will the combo loop work to hang the badge or do I need additional items to attach the badge? Thank you for your question. The GBC Black OptioBraid Lanyard with Combo Loop is designed to work with name tags / badges that have a Bulldog Clip. Can I attach ID Cards (Driver License size) to this 1 cent Lanyard? How? Thank you for your question. The GBC Black OptioBraid Lanyard with Combo Loop do not have a way to pouches. You would need to use a clasp or ring to connect it to the closed loop on the lanyard. Thank you for your question. The GBC Black OptioBraid Lanyard with Combo Loop, when available, are currently being sold individually by the piece.